While email is changing, these changes do make email more vital and effective. For example, email is not a stand-alone medium anymore. Other channels like social media integrate well with it. Sales was the main goal for 26% of all campaigns, engagement for 22%, followed by acquisition on 16%, lead generation on 12%, retention on 11%, brand awareness on 7%. Conversion rates are used to evaluate campaign success for 60% of marketers. Email marketers are building a strong business case with a high ROI and less internal constraints. Trends reflect a positive outlook and a need for focus on data quality. When it comes to email marketing metrics, marketers have reported better delivery rates in general, as well as open rates. Only a few marketers reported that their delivery rates and open rates had decreased in 2014. The same better results were true for click-through rates, however with unsubscribe rates it was a bit of a different story. Most marketers noted that their unsubscribe rates stayed the same (67%), however other said they increased (15%) and another 18% said they decreased. 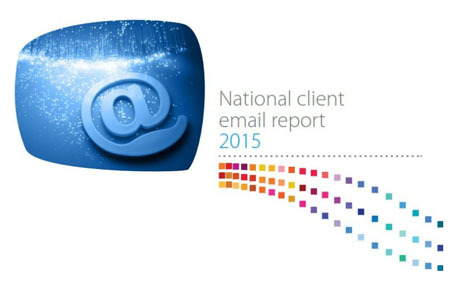 Read more on the National client email report 2015 at the DMA website.